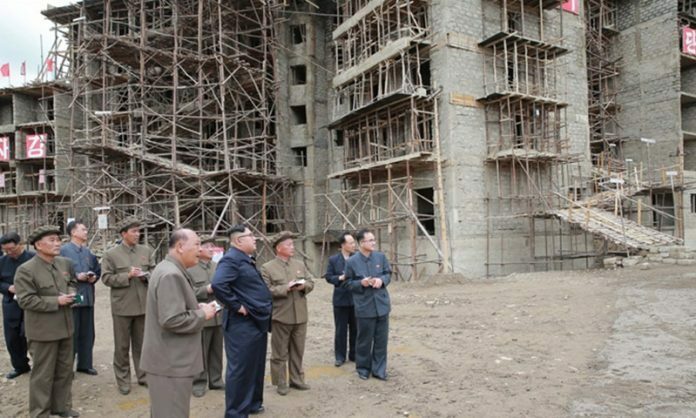 North Korean leader Kim Jong Un visits a construction site in Yanggang Province, Samjiyon County. Image: Korean Central News Agency (KCNA). 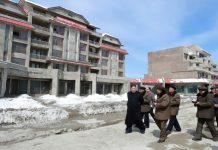 North Korea has launched a series of large construction projects across the country including new buildings on the streets of Pyongyang, as well as the modernization of Samjiyon and the Wonsan-Kalma Coastal Tourist Zone. Meanwhile, North Korean officials have been focusing on both acquiring [new] construction materials and preventing illegal siphoning off of existing materials from construction sites. Supplies of steel beams, wood, cement and other construction materials have dwindled due to international sanctions and damage from floods. The North Korean authorities have been tightening security to prevent the theft of such construction materials, an issue the authorities have traditionally been more lax about. “Kangwon Province has suffered a lot of damage from flooding, including its railways, and the authorities are having trouble supplying enough construction materials to the Wonsan-Kalma Coastal Tourist Zone,” a Kangwon Province-based source told Daily NK on September 10. At North Korean construction sites, soldiers from the military construction teams and members of construction “shock troops” commonly siphon off materials to sell to traders for food. After eating their lunches, construction workers are even said to fill their lunch boxes with cement powder to take away and sell. The source added that these crimes are difficult to prevent. State supplies of construction materials are almost non-existent and the government demands “speed battles” to complete construction projects at a rapid pace. Given the situation, even project directors are ignoring acts of stealing by laborers who are often just trying to buy more food. 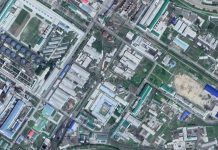 The authorities have ordered stricter monitoring of construction sites in Samjiyon County, Ryanggang Province, where massive amounts of resources are being mobilized for modernization projects, along with project sites in Hyesan. “Massive construction projects have continued for so long now that there have been many cases where even government officials are siphoning off state-owned materials for a profit,” said a separate source in Ryanggang Province. These threats have reportedly had some consequences. 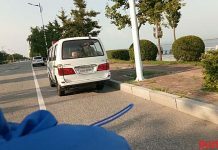 An official tasked with receiving construction materials [at construction sites] and a police officer were arrested over the past week for stealing cement being sent to the construction site in Kalma, Kangwon Province. Another construction worker who stole nails from a construction site was caught by the site’s project director and is now under investigation. “[The Party] has said that it plans to severely punish those who steal state-owned property – even if someone steals as little as a one-meter-long steel rod, a kilogram of cement, or one piece of equipment – and will also deploy more security forces to the sites. These security personnel, unlike project directors, have no personal relationships with the construction workers,” said a separate source in Kangwon Province.